The Ulster Unionists had begun preparations for armed resistance to Home Rule in 1911. In 1912 leading Unionists decided that it would be a good idea to have a solemn and binding oath committing Unionists to the cause. They believed that it would show people both at home and abroad the solidarity and determination of Ulster Unionists. Preparations were made across towns in Ulster in the lead up to "Ulster Day" set for the 28th September, 1912. George Young led the preparations in Ballymena. The Covenant was available to sign in the Protestant Hall, the Town Hall, the YMCA building, the Parochial Hall, a tent in the People's Park, the Harryville Mission Hall, as well as several street corners. Church services were held and Protestant businesses were encouraged to close for the afternoon. By the end of the day almost a quarter of a million men and almost as many women, who signed a similar document, had committed themselves to the anti-Home Rule cause and the whole exercise was deemed a resounding success. 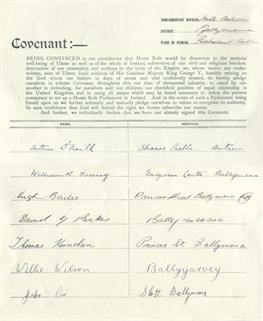 Ulster Covenant signed by Arthur O'Neill and William and George Young.